Yup it such great tip for windows 7 users. Thanks for sharing great post. It doesn't seem to create the logs for all types of drives. I have two Lexar drives and one Sandisk drive, and it would only show up for the Lexar drives. That's interesting – I'll have to take a look at this. Is the Sandisk a typical flash drive? Anything out of the ordinary with it? Do you got a solution for the sandisk? I have the same experience with a Sandisk – it shows up in as a Local Disk, not a removable. I can't say for sure that the types of devices you mentioned won't be included in this log, but I doubt they're recorded in the same manner as USB removable storage devices. Do you see any events being generated for these devices? I wonder if WinXP event logs do this too . . . . would help at work. logparser -i EVT -o datagrid "SELECT EventID, TimeGenerated FROM Microsoft-Windows-DriverFrameworks-UserMode-Operational.evtx"
Error: Error retrieving files: Error opening file "C:TempMicrosoft-Windows-DriverFrameworks-UserMode-Operational.evtx": The system cannot find the file specified. Try extracting or copying the event log from the System32winevtLogs directory into C:Temp (or wherever you're executing LogParser from) and rerunning the command. You'll also need to replace "Microsoft-Windows-DriverFrameworks-UserMode-Operational.evtx" with "Microsoft-Windows-DriverFrameworks-UserMode%4Operational.evtx". logparser -i EVT -o datagrid "SELECT EventID, TimeGenerated FROM Microsoft-Windows-DriverFrameworks-UserMode%4Operational.evtx"
The above will basically dump the Event ID and TimeGenerated of every record in this event file. You will need to perform some selection criteria to turn the data into information. Adding the field "Strings" will help somewhat. al.evtx": The parameter is incorrect. when i try to run the script. 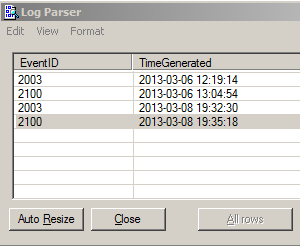 I have copied the log file into the logparser program folder and am running as admin. Any thoughts? I haven't been able to recreate your error so I can't say for sure what the issue is, but have you tried changing your file path parameter? You could try changing your working directory to the "Log Parser 2.2" directory and specifying the event log without the full path. You could also move the LogParser.dll, LogParser.exe, and your event log into another folder (outside of Program Files) to see if that makes a difference. I'm looking for Microsoft -Windows-DriverFrameworks-UserMode/Operational log in a win 8.1 system, without success. I think that this log only exists in a win 7 system. do you know if this log has been changed or renamed in win 8? In my testing a few months back, this event log was disabled on Windows 8.1. If enabled, you should find it in its normal location. I have not conducted extensive testing to see if the event IDs and record details are the same between Windows 7 and 8.1. There seems to be several typos in the document that make a big difference. When using the serial number, it seems you need to use a %before and after the serial number (ex: ~~WHERE (EventID=2003 AND STRINGS Like '%070134C10H655B32&0%') OR (EventID=2100 AND STRINGS LIKE '%070134C10H655B32&0%27|23%')". As mentioned earlier, its best to move the dll and exe into a empty folder and then copy the log file (Microsoft-Windows-DriverFrameworks-UserMode%4Operational.evtx) from c:windowsSystem32winevtLogs, you can rename it test.evtx to make your command lines shorter and easier to troubleshoot with. Thanks for the comment. It looks like the wildcard wasn't in front of the serial in all places of the post so I've updated that. The file name wasn't necessarily meant to be copied and pasted; I was just identifying where the file name should go in the LogParser command. You might find the batch script I wrote to automate this process helpful as well – http://dfstream.blogspot.com/2014/02/usb-device-tracking-batch-script.html. This doesn't work at all for external hard drives. No event is logged under Microsoft-Windows-DriverFrameworks-UserMode/Operational. I have a 2TB external drive formatted using Ntfs. The only event I found that gets logged when I connected it is Event 98, and I may be lucky because that's an Ntfs event, the source is Microsoft-Windows-Ntfs. Yes, unfortunately external hard drives are not currently tracked in this event log (at least not the last time I checked). This was the case with Windows 7 as well. How was the sandisk readable? I’d like a way to figure out what’s causing these random plug-n-play badonk sounds.